If a diet pill could somehow take on a human form, then Orovo would be a smooth talking confidence trickster with the pin striped suit and waxed moustache. Orovo promises you fast weight loss and younger looking skin – then disappears providing you with neither and leaving you feeling used and abused, the only pounds you would have lost are the folding type that reside in your purse. Orovo is similar to so many of the modern diet pill products that seem to be coming from the United States – Lipovox is another typical example. The one positive that can be taken from Orovo is that the way the product is presented – but then again have you ever seen a disheveled looking confidence trickster? 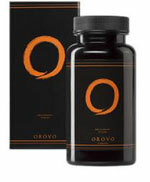 The ingredients contained in Orovo are based on the much discussed and misquoted Superfoods – natural substances that the human body craves for ultimate health and well being. Superfoods can provide a benefit to health but so mnay differing ingredienst combined in one tiny capsule is not going to make the fat thin, the old young and the spotty …less spotty. Can cause a feeling of stupidity once the realisation has kicked in that all you have got for your money is pretty looking “pill” bottle. UK consumers are better suited to products that are focused on the UK. Here are several in no particular order each offering various levels of success. Adios – A natural weight management tablet that is sold in most high street stores. Lipobind – Possibly the best selling slimming pill in the UK. Can be purchased from many outlets. Proactol – Voted the best fat binder of 2008 by readers of the Telegraph. Unique Hoodia – genuine 460mg of Hoodia powder. Ideal for surpressing appetite. If you want to read reviews about any of the products listed or mention then type the brand into the search bar in the top right hand side of this website.